We have seen many revolutions happening in the terms of power and functioning of arms and guns, but Rapid safe is a unique concept which basically deals with the safety and security of these arms and guns. A gun might be a source for providing protection to us, but if it gets into the hands of someone who is not worth, then it can create lots of disturbances and also problems for the original owner of the gun. Hornady Security Rapid gun safe is an exclusive concept regarding firearm defense that has amalgamated the easy access along with safety and security. 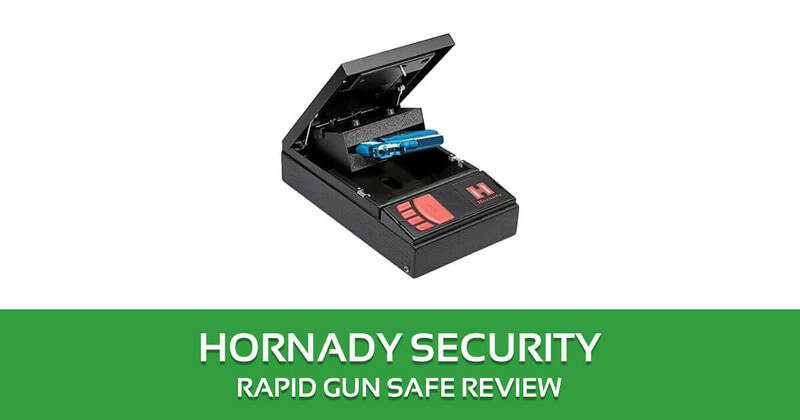 Hornady Security Rapid Gun is the one that is not only high on security but also provides quick and prompt access. It comes in red and black combination and is one of the best bedside guns safe in the category. It is loaded with a number of advantages that make it different and class apart in its category. Normally operated by normal 110v power. Also have the option of using batteries as a backup. Now there is no need to get panicked while opening your safe. By using patent-pending Radio Frequency Identification (RFID) for instantaneous access this is the best gun safe. Just place your RFID bracelet card or key fob over its reader and it opens up within seconds to provide you with your gun. The case includes two bracelets, a key fob and RFID cards. The safe also has a keypad that can be programmed. There are chances that you might not be carrying your wallet or unlike every second person, you do not keep tracks of your keys. Being manufactured by a company like Hornady, which is a well-known name in the firearms industry, this safe already have made its place. It is a single gun storage container and holds a single gun. Its designing is actually unique and robbery proof than most of the bedside gun safe. It also exceeds the ASTM International performance standards for youth resistant firearms containers. The basic difference between Hornady rapid safe and another bedside gun safe is quite clear when the safe opens and displays the way in which gun is placed. When the safe opens the gun is stored within two foams tightly. Whenever the safe opens up you will find the gun to be stored in such a way that it rises up and is placed at such an angular position that makes it easy to withdraw the gun from safe. There is no need for wasting time in searching for your gun. With a strong construction and design, Hornady rapid safe is the best gun safe in terms of safety and security. When it is empty its weight is around 16 pounds whereas its length is approximately 16 inches which make it tough to be getting carried or stolen. It is made up of 16 gauge steel and possesses a strong dual-lug locking system that is made up of ¼” steel. For added safety of the safe, it is provided with 30 inches long 1500 lb rated cable that can tie the safe to an immovable object. 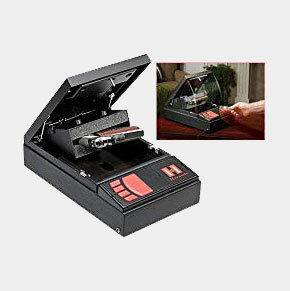 Whenever you open Hornady rapid safe then due to RFID technology being used, it opens within a click. And it is not meant just for saying. You can record the time it takes to open, presenting you with your gun in ready to grab access which is less than even one second, and yes, it’s true. Thus now within a blink, you can have your gun from the safe into your hands. Affordable price, worth of the value. Does the Hornady gun safe have backup options available for access? Yes, along with two RFID bracelets, key hog and RFID cards, it also possesses the option of personally programmed code. It is also available with a conventional key lock in the form of backup. is Hornady gun safe electricity operated or battery operated? Hornady gun safe comes with both options, which means that under normal conditions it uses normal 110 V household power. But in the case of emergency, it has the option of battery operation. Can I store guns with somewhat long barrels in Hornady gun safe? Yes the padded sleeves under which gun is placed can be removed and thus allows you to store guns up to 6 inches long barrels. Hornady Security Rapid gun safe is a perfect amalgamation of strength along with easy access. It is made up of the sturdy steel body and also possesses RFID (Radio Frequency Identification) that lets you have access to your gun within less than a second. With numerous options for easy access, this gun safe is unique and best in its class. With the innovative RFID embedded bracelets, it is quite an innovation. Having angular and safe placement of gun, it allows the gun to be always ready for use. With a backup in the form of programmable code and key operated opening, it provides a lot of support. It is worth its price and it has got my approval as the best gun safe.